Hey everyone! How’s your week going? Can you believe it’s April already? I really find the constant move forward of time to be quite the nuisance. Not to mention there’s never enough time to do all the things I want to do! I did have a nice weekend though, full of video games and relaxing with my spouse. With the exception of some hiking here and there, we do love a good relaxing weekend. I really do hope you like it! Thank you Helen for becoming my newest patron on Patreon! 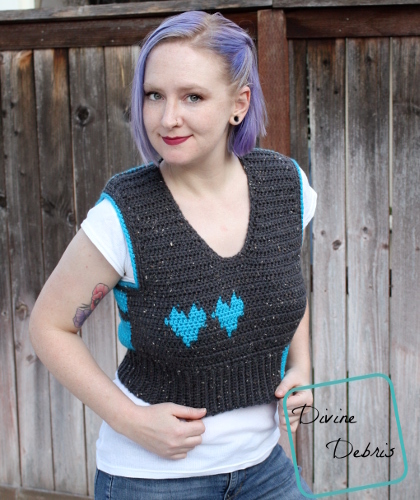 This pattern is worked in 4 sections: the Front, the Back, the Waistband, and the Arm/Neck details. 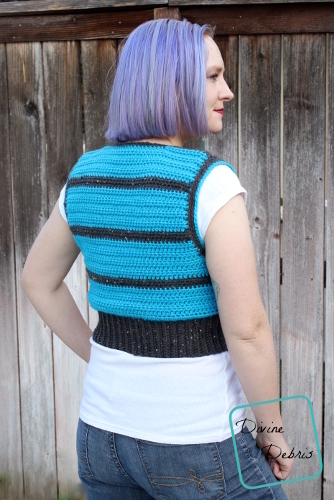 The Front and the Back are worked from the bottom up, row by row with at turn at the end of the row. 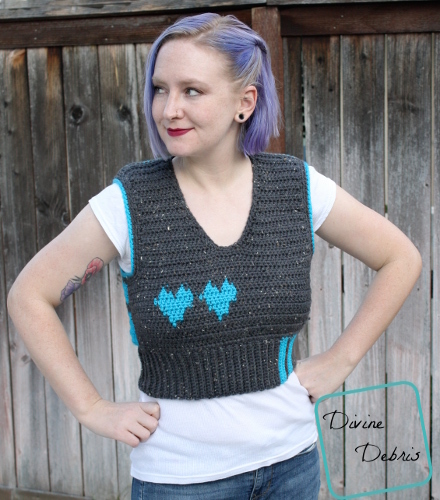 The Arm/Neck detail are worked in the round with a slip st into the first st of the row. The Waistband is created using the technique by TLYarnCrafts to add ribbing from this YouTube video. 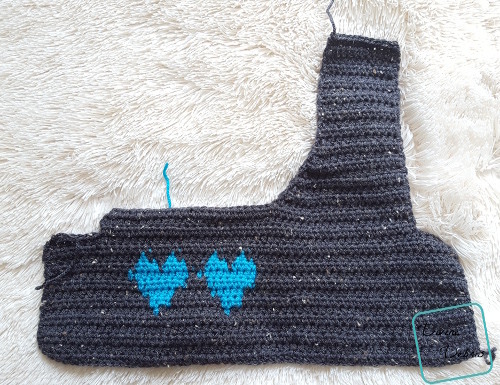 In the graphing section of the Front piece, the yarn is not carried. Instead the float technique was used. Then color B was dropped when it wasn’t in use. 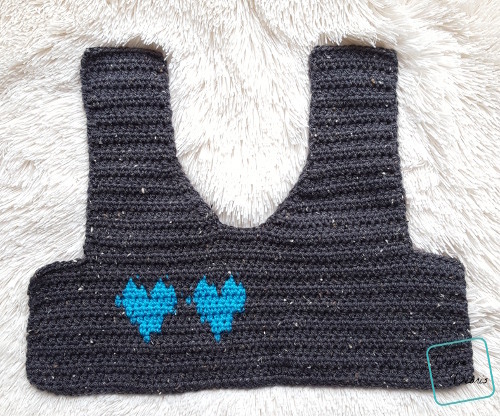 You could make this longer by adding more rows before you get to row 8 (where the graphing starts on the Front) or by adding more stitches to the Waistband. The ch-2 at the beginning of some rows does count as a stitch. 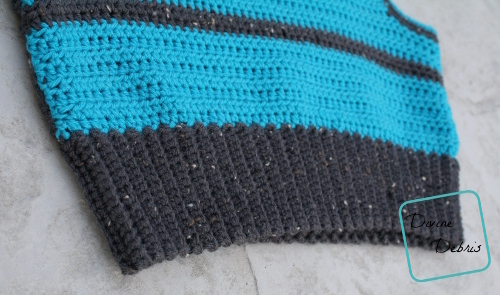 The ch-1 at the beginning of some rows does not count as a stitch. The example is the medium size. 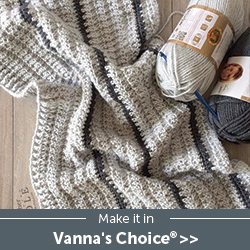 Color A is gray (Vanna’s Choice in Graphite) and color B is blue (Vanna’s Choice in Aqua). Note: the even rows are the RS. Fasten off. Move onto the Straps. 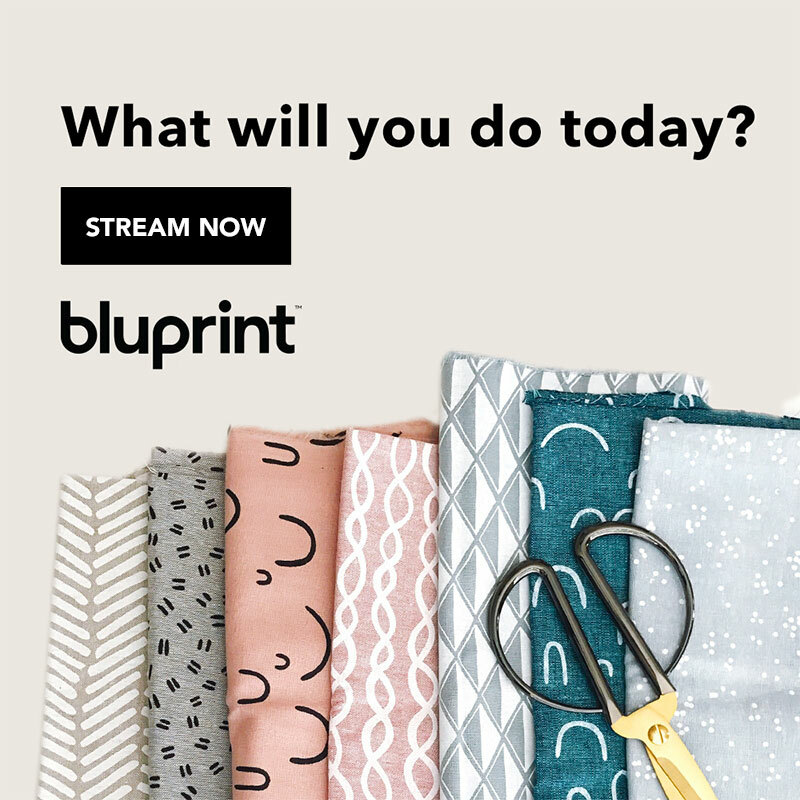 The following rows you will be working on the Right Strap (when you’re looking at your project). 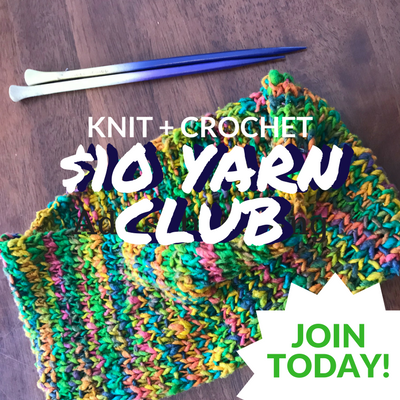 This section will be worked on the unused stitches from row 3. Fasten off, weave in your ends. Block if necessary. The even rows are the RS. The sample is striped, but the pattern written below is written in one color. Fasten off, weave in your ends. Block if necessary. Move onto Seaming. 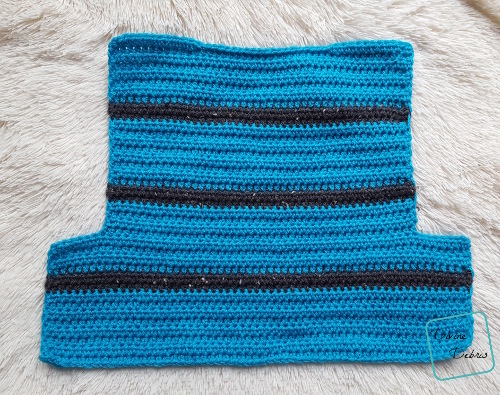 Seam together the Rows 1 – 14 (16 – 18) on both edges in your preferred method of seaming. Then seam together Row 21 of both of the Straps to the hdcs of Row 38 (40, 41) of the Back in your preferred method of seaming. With the RS facing you. Optional: go down a hook size to create a tighter band. Using the technique displayed in the TLYarnCrafts video, create a band that’s 10 sc for XS |15 sc for S – 2X across (this will give you a band approx 3″|3.5″ in length). 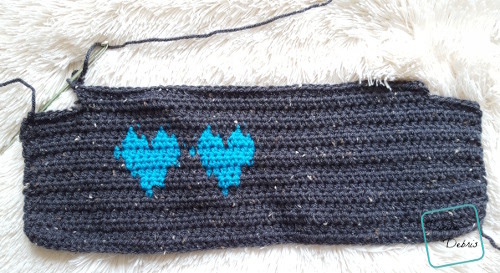 Change colors as you’d like, make the band longer or shorter by adding or subtracting stitches. Go all the way around the other side of Row 1 of both the Front and Back sides. Seam up the first row and the last in your preferred method of seaming. Fasten off, weave in all your ends. 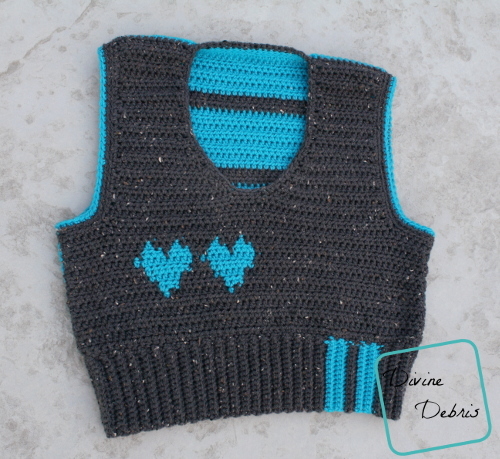 You could also do this section in a fphdc/bphdc repeat or just in single crochets if you didn’t want to make it in the ribbing.